Are you always online and think you’re capable of managing a big brands accounts? 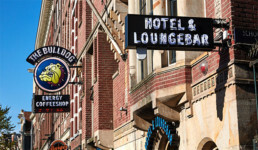 How about doing it for the social media platforms of the iconic Amsterdam brand The Bulldog? If so then this vacancy is for you. The Bulldog is looking for a Social Media Specialist. We are looking for a social media specialist for the daily design and placement of content on our social media platforms to keep our target group curious and to create “buzz” around new products. As a social media specialist you are responsible for managing the social media platforms of The Bulldog. You have a way with words so to speak, you have an excellent command of the English language and the realms of Facebook, Instagram, Youtube and Google should all be familiar to the candidate. You have a clear vision how you can use social media strategically to make a brand stronger. You are also familiar with the world of The Bulldog and the market in which the company operates. You will work in the nicest living room in Amsterdam where no day is the same. The Bulldog is a place where people meet and the same great atmosphere hangs at the head office. You end up in a team of eight colleagues. Hard workers, just like you, but pleasure is just as important. You will therefore be included in The Bulldog family!